Finally, just in the nick of time! 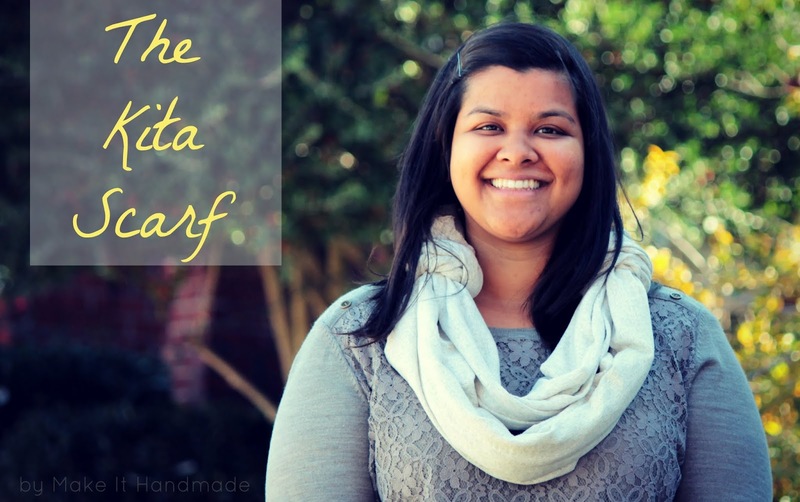 I had planned to post about my scarf for Rikka's Ring Your Neck Challenge ages ago , but due to holiday induced laziness and procrastination; I'm just now getting to it. The Kita Scarf is a simple knit scarf with a twist. The scarf is portion is just a simple rectangle cut out of jersey knit. Since knit doesn't fray, I didn't finish any of the edges. The twist is two circles of knit fabric which help convert the scarf into a cowl, headband, shawl etc. I wanted to show you all the different ways it could be worn... but I'm terrible in front of the camera-- being a hand model for the fingerless glove post was unnerving! Luckily, I just happen to be related to the most beautiful woman in the world! Yes, I got my gorgeous baby sister to model for me. 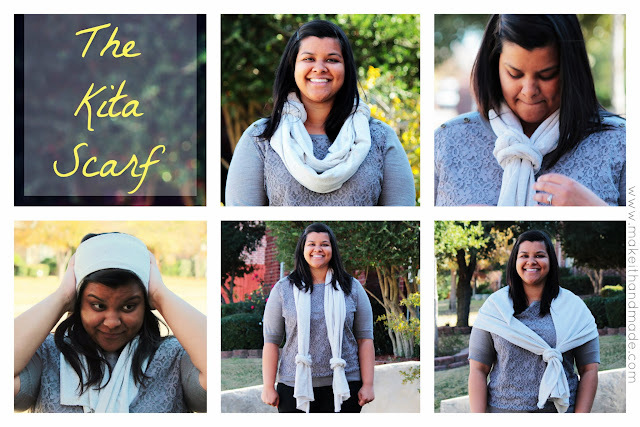 Here are the different ways to wear a Kita Scarf. Clockwise from the top: cowl, scarf, shawl, stole and headband. FYI: As part of the challenge, we were so supposed to use a new (or new to us) technique. I've been wanting to try this tip about using tissue paper to stabilize knits while sewing from Me Sew Crazy. So, for what little sewing this scarf required, I used my sewing machine and tissue paper-- and I didn't touch my serger once! Find a yard of jersey knit. I recommend staying away from interlock for this scarf. You want someting with a lot of curl when it's stretched. Cut a 24" by 60" rectangle from your knit, making sure the stretch is going lengthwise. From the leftover jersey fabric, cut two smaller rectangles 5" by 30" (again with the stretch going lengthwise). These will become the circle pieces. Making sure to put right sides together (the fabric will curl away from the right side when stretched) sew the short ends of each rectangle together, making two tubes. Stretch these pieces slightly-- they will curl inward hiding the seam and raw edges. Wrap the small circles around the scarf like you would wrap a rubberband. Enjoy- or wrap up for an easy gift. Bonus Points: Send me a picture or link! 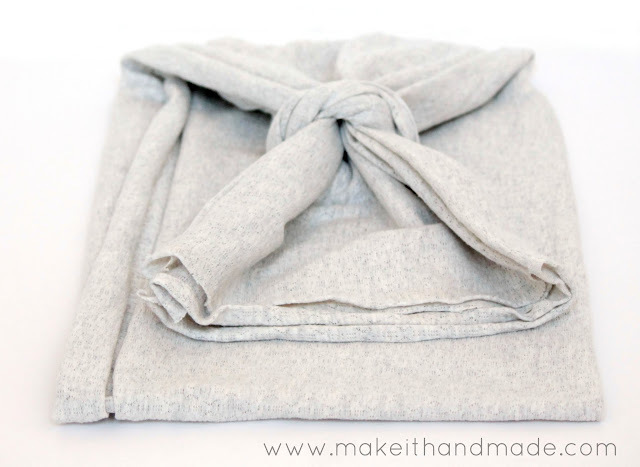 I'd love to see anything you've made from a Make It Handmade Tutorial! To change styles, simply thread the ends of the scarf through the circles as shown in the picture above. For the cowl style, make sure the circles are covering the scarf ends. For the 'headband' style the circles are wrapped at the nape of the neck. Check out the other scarves over at Ricochet and Away! Thanks for hosting the challenge Rikka! Please Subscribe (using RSS), Sign up for Emails, or Follow using Blogger to make sure you don't miss my weekly tutorials! What a clever idea to add the two circles!!! This makes for a very versatile scarf. Your scarf looks GREAT and I love that it was so easy to make. Cute and clever! My favorite combination. Congrats on meeting the challenge!!!! Pat yourself on the back, it's all fun from here on out! Thanks Rikka! And thanks for organizing all this, putting out the emails etc! It's a lot of work! Thanks Pam! It was something that I had in my head for a while-- but of course I just finished at the last minute! You did a great job getting your scarf done ahead of time. I'm confused! How can I get a 60" piece with lengthwise stretch from a yard of jersey knit??? I want to make this scarf and need your help with this. What am I not seeing? 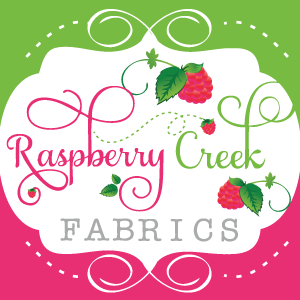 Your fabric should have a 60" width as opposed to the normal 45"-54" width. 1 yard will allow for the scarf and the 2 circle rings with very little waste left over.